When all workers join together, we can improve working conditions for everyone. That's why CWA has been engaged in ongoing solidarity efforts with international call center workers. 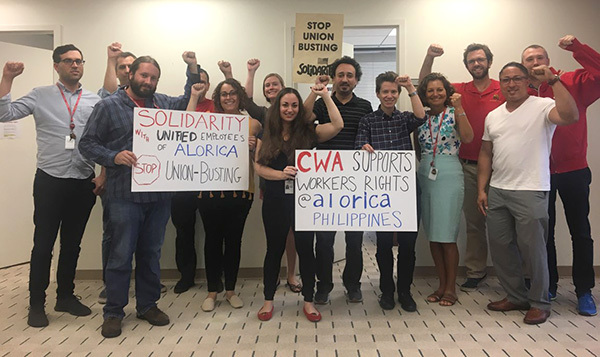 During the 2016 Verizon strike, members of BIEN, a call center workers' union in the Philippines who handled Verizon calls, supported CWA members in our fight, holding pickets and workplace actions. Now, BIEN members at call center company Alorica are facing threats to their jobs because of new restrictive policies imposed by management. Alorica management refuses to recognize the workers' union. The company has been systematically attacking union members and officers through arbitrary dismissals, continuous harassment, and threats of filing lawsuits. Sign the petition to stop union harassment and arbitrary dismissals at Alorica-West and to recognize the workers' union. CWAers are standing with Alorica workers in solidarity in their fight for fair representation at work.